Who is not familiar with the calculator? In this era of increasingly sophisticated forms of the term calculator and the calculator is not foreign to us, both children and the elderly people who have all been seen and even used and has a calculator. So many types and variations of the calculator form, the various brands were created for the product calculator. Various electronic devices, such as cellular phones, iPhone, and computer is integrated with technology calculator. 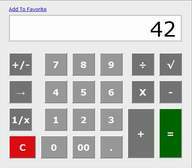 In the development of this calculator technology is not only found in physical form on an electronic device, but can also be found online on the internet and appropriately referred to as a calculator online.